HIFI4ALL.DK | Tilbudsavisen | Audion Audio Black Shadow Mono amp. Audion Audio Black Shadow Mono amp. Following much demand from our customers Audion have re-launched the legendary Black Shadow 845 mono-block power amplifier Delivering 25 watts in pure Class A. 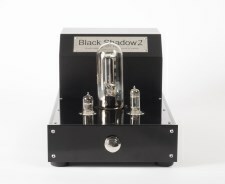 The new Black Shadow has been upgraded with an extra buffer stage, improved mains and output transformers, slow start HT to protect the valve life and better components - couple that to a large polypropylene capacitor power supply and large bypass and decoupling capacitors you are guaranteed fast and fluid transient response.. This amplifier is hand built and hard wired using solid silver 5 *9's in most of the audio path (except the output transformers, input rca's, speaker binding posts and tube bases). Wherever possible the components are sourced from Europe and the USA and avoiding inferior Chinese components. This triode based mono-block amp uses no (zero) feedback in the design. The Black Shadow 845 SE amplifier comes with Shuguang 845's as standard but can also be supplied with a choice of 845 tubes upon request. This amp will work with most speakers over of 83 - 4db efficiency. Ideally matched with our range of Electron cables. The amps deliver 25 watts into 8 ohms This has both 4 and 8 ohm outputs.. Upgrade options are available for this model, see upgrade options at end. To provide the fastest transient response possible, solid-state rectification is used, and the design and its implementation ensures phase coherent harmonic structure throughout the frequency spectrum. The 845 output tubes used are well within their specified performance envelope to ensure low distortion and optimum sound quality, as well as extended tube life. .